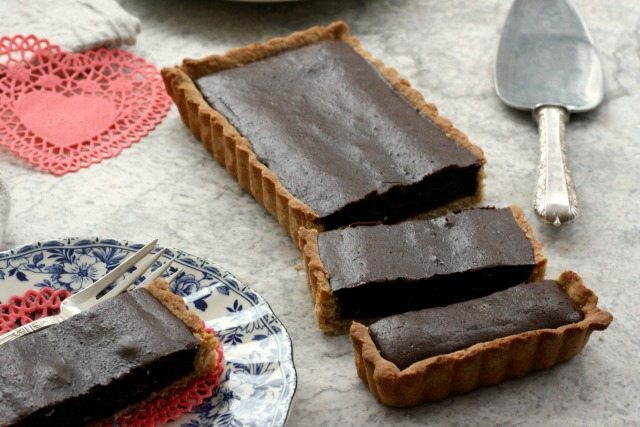 A decadent and easy chocolate tart recipe that tastes delicious warm or at room temperature. Chocolate and molasses is a magical combination. Just a bit of molasses can intensify that taste of good, dark chocolate but it gives chocolate a nice balance too, adding flavour notes of it’s own. 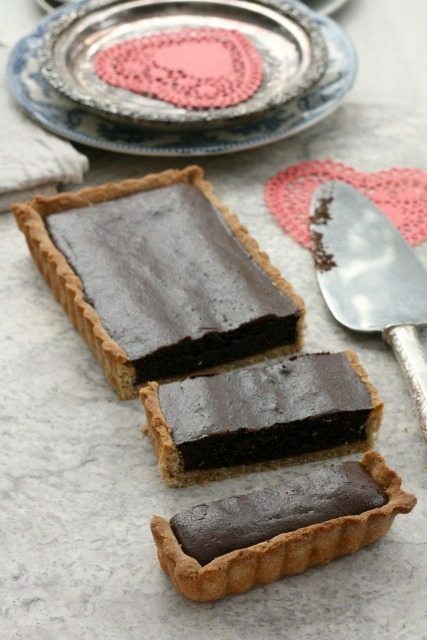 This is a lovely pastry recipe and fairly easy to make. I made mine with half whole wheat flour for more flavour and because I love to tuck wholemeal flour into my baking. In a food processor pulse the flour, sugar, baking powder and salt. Add the butter and pulse until it’s pea-sized. Add yogurt and pulse until the dough starts to come together. Scrape onto a lightly floured surface and gather into a ball, kneading a few times if there is still flour to incorporate. On a lightly floured surface roll out dough and fit into a rectangular tart pan or an 8” or 9” spring form pan. (If using a spring-form pan ensure the dough comes up the side 1 ½”.) Prick the dough with a fork and chill for 30 minutes. Preheat the oven to 400°F. Bake tart shell for about 15 minutes or until the crust is golden brown. Let cool slightly. 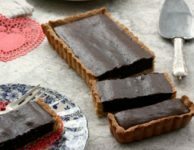 While the tart shell is baking, melt the chocolate with the cream in a double boiler or in a heat proof bowl over a pot of simmering water. Remove from heat and whisk in the brown sugar, molasses and eggs. Stir in the flour and whisk just until incorporated. Pour into the crust and bake about 12 minutes (until the filling is set at the edges but still soft in the centre). Don’t overbake. Serve the tart hot or warm.